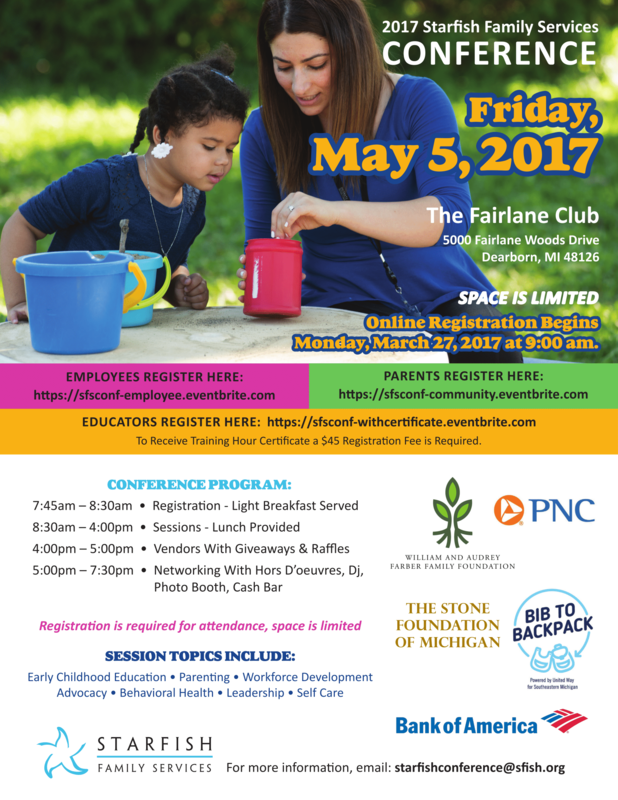 Join Us for the 2017 Starfish Family Services Conference! 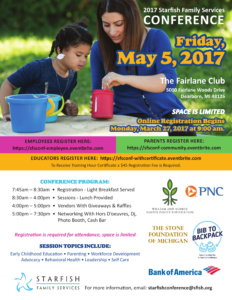 Join us on May 5, 2017 for the 2017 Starfish Family Services Conference at The Fairlane Club (5000 Fairlane Woods Drive, Dearborn MI 48126). This conference benefits employees, parents, and educators, with sessions on early childhood education, parenting, workforce development, advocacy, behavioral health, leadership, self-care, and more! Attendees will be treated to a light breakfast during registration and a full lunch will be provided in between sessions. There will also be giveaways, raffles, and a fun night with a DJ, photo booth, and a cash bar! If you wish to attend the networking event, you have to register separately.